Which month to be celebrated as National Nutrition Month every year in India ? Who has been recently appointed as the 1st Chief Commercial Officer (CCO) of Bajaj Auto Ltd ? 'BRICS in Africa: collaboration for inclusive growth and shared prosperity in the 4th Industrial Revolution' is the Theme of which International Event of the year 2018 ? 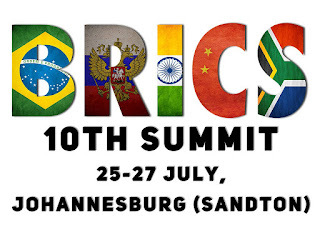 The 10th BRICS Summit was recently held at ? Who was recently nominated as the 1st woman chief justice of a Pakistani high court ? The Rajya Sabha recently passed a bill, which empowers authorities to confiscate the assets of economic offenders who flee the country. Name it ? A 20-year-old girl from Tikamgarh was crowned with Miss Deaf Asia 2018 title. Name her ? India has extended ₹1,378 crore ($200 million) Lines of Credit (LOCs) to which country after PM Narendra Modi held talks with the nation's President Paul Kagame ? The Union Government has reduced minimum yearly deposit required under popular girl child savings scheme, Sukanya Samriddhi Yojana to Rs. _________ from Rs. 1,000 earlier. Kargil Victory Day (Kargil Vijay Diwas) is observed on ? Who is the Chief of Army Staff India ? According to the US-based Institute for Energy Economics & Financial Analysis (IEEFA) report, which state is the new national leader in renewable energy generation ? The Parliament recently passed an anti-corruption Bill, which, for the first time, provides punishment to bribe givers upto 7 years. The 1st food critic to win the Pulitzer Prize for Criticism (2007), was recently passed away. Name him ? The West Bengal Assembly has recently passed a resolution to change the state's name to ?